LG's Q series phones are essentially more affordable, less powerful cousins to the flagship G series. The LG G7 ThinQ launched earlier this month and it seems like a passable high-end Android phone if a little unremarkable. LG's cheaper Q7 phones have now arrived, and they're pretty much as you'd expect in both the looks and specs department for mid-range devices. According to LG, they offer the same "premium features typically found in more expensive flagship smartphones." I'll let you be the judge of that. As we saw last year, there are 3 different phones in the series intended for different regions, each with the same basic form factor and size. They all share a 5.5-inch 18:9 FHD+ FullVision Display, with curved glass on the front and US military grade metal on the rear. The standard Q7 and Q7α (yes, that's the alpha symbol) come with 3GB of RAM and 32GB of storage, plus a 13MP rear camera with PDAF, and either an 8MP or 5MP (Super Wide Angle) on the front (also region dependent). The Q7+ goes up to 4GB of RAM with 64GB of storage and a 16MP rear camera. All three variants offer a commendable IP68 rating, sport a 3,000mAh battery, and ship with Android 8.0 Oreo. Although they aren't "ThinQ"-branded phones, they do get access to LG's Q Lens feature (a less impressive Google Lens) and in spite of only having a single rear camera, they have a software-powered portrait mode. Audiophiles will be pleased to see Hi-Fi Quad DAC (Q7+ only) and DTS:X 3D Surround Sound. LG's attempts to make the fingerprint scanner more useful are still at play. This time around, the rear-mounted sensor doubles as a camera button, can be used to take screenshots, and can also "control the notification bar," which probably means you can bring down the notification shade as with most Android phones right now. Pricing and availability will be announced at a later date, though you can expect them to go on sale in emerging markets first. All 3 models will come in a Moroccan Blue colorway, but the Q7 and Q7+ will also get Aurora Black and Lavender Violet options. 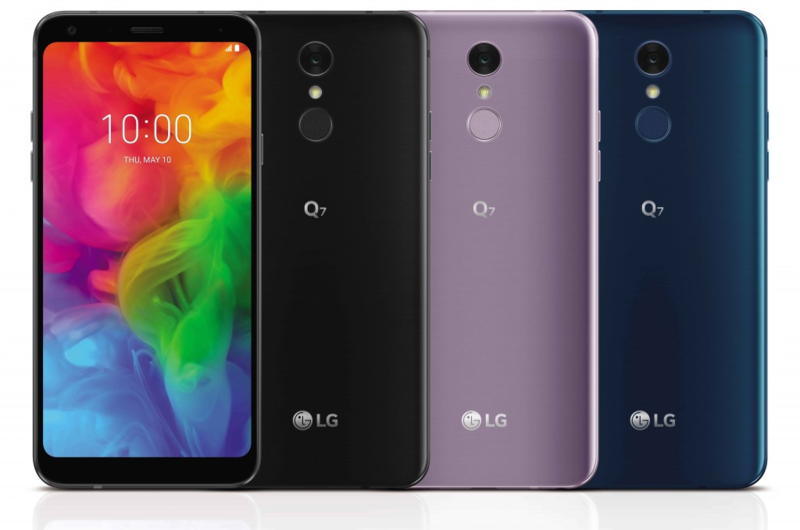 SEOUL, May 21, 2018 — LG Electronics (LG) today announced the 2018 LG Q7, the newest Q series mid-range smartphone from LG that offers premium features typically found in more expensive flagship smartphones. Shipments to key markets in Europe will begin early next month, followed by countries in the Americas and Asia. 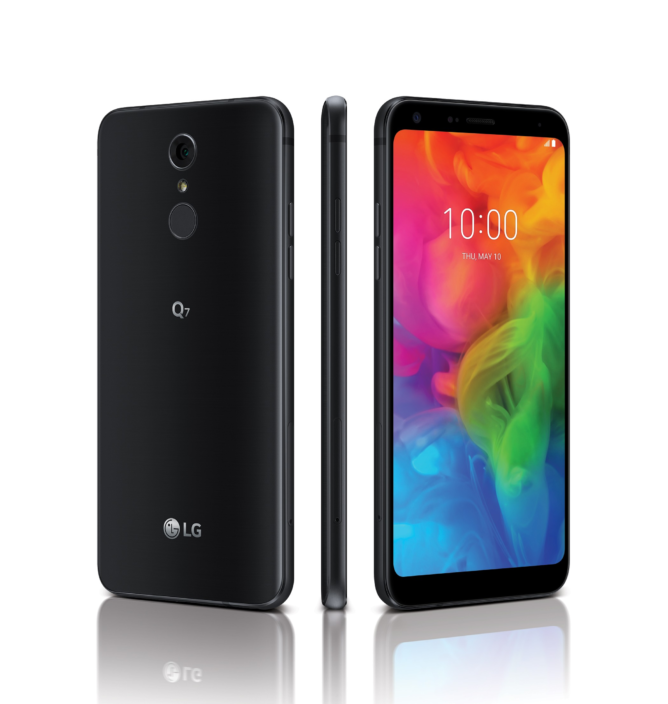 The LG Q6 that debuted in 2017 developed a fan base based on its intelligent balance of premium features and value, most notably for being the first in its class to offer a 5.5-inch FHD+ FullVision 18:9 aspect ratio display in a sleek, stylish, thin-bezeled body. The LG Q7 builds on that foundation with even more high-end features such as Portrait mode, QLens, Hi-Fi quality audio, DTS:X 3D Surround Sound, water and dust resistance and a fingerprint sensor on the back. The Q7 family consists of the Q7+, Q7 and Q7 α with the latter upgraded to 3GB RAM and 32GB ROM. On the front, the LG Q7 features a 5MP camera with a 100-degree Super Wide Angle Lens that captures more of the background or more friends. New to the LG Q7 is Portrait mode that allows users to take selfies with blurred backgrounds for a pleasing bokeh effect. With the LG Q7, shutterbugs won’t miss any shots with Phase Detection Auto Focus (PDAF) on the rear camera, 23 percent faster than traditional auto focus. LG also included QLens in the new Q7, a useful camera AI feature until now only available on LG’s premium smartphones. Leveraging AI technology for image recognition, QLens lets users use the camera to improve the image searching and online shopping experience. Capture any item with QLens and get information on where to buy the product online as well as recommendations of similar items. QLens can also perform an image search to see matching or similar images of food, clothing, celebrities or landmarks such as buildings and statues. The LG Q7 is also the first in its price range to offer DTS:X to deliver virtual 3D surround sound, up to 7.1 channel audio through headphones for users to enjoy their favorite entertainment while on the move. Another first in its category, the LG Q7+ comes equipped with Hi-Fi Quad DAC for richer sounds without distortion when paired with high quality earphones. The LG Q7 features a 2.5D Arc Glass design with rounded-edges that makes the device comfortable to hold and operate with one hand. The metallic body and rear metal frame of the Q7 is able to stand up to the rough and tumble of active use thanks to its IP68-certified water and dust resistance rating. The LG Q7 has passed 14 of the MIL-STD 810G tests designed by the United States military to evaluate the performance of equipment in harsh environments. And Qualcomm’s Fast Charge technology can charge the Q7’s battery to 50 percent in about 30 minutes for added user convenience. The addition of the Smart Rear Key fingerprint sensor complements the premium experience of the LG Q7. The rear fingerprint sensor located conveniently below the camera lens not only allows users to unlock the phone easily, it can also double as the camera shutter button, take screenshots and control the notification bar. The LG Q7 will be available in three configurations of Q7, Q7+ and Q7α, depending on the region and market. Price and purchase details will be announced locally at the time of availability. * Product name, specifications and features may vary depending on the particular market.